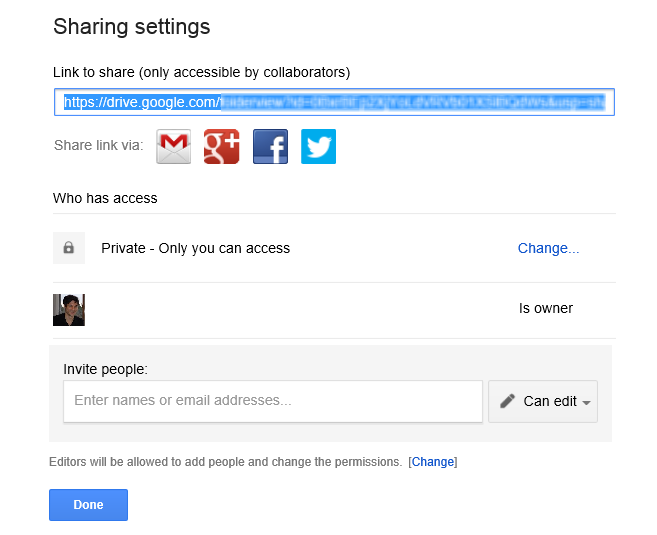 The aim of this article is to illustrate how to provide sharing permissions on your Google drive which you intend to integrate with your locker. Follow this link to learn how to Integrate Google Drive with your Locker. In our Google Drive integration, School Loop will follow the sharing permissions for files and folders as set by each user in their Google Drive account. Google has settings that give people the right to view your document as long as they have the link to the document. See Google's support pages for more information about sharing files in Drive and for instructions on how to share files. The settings you choose for your files and folders will determine how those resources will be shared in School Loop. Bring up the share dialog. For documents, just open them and click the blue Share button. For folders, just open them and click the menu at the top of the screen. In the access area, click Change to select if the document is open to the public or only people who have the link. See our FAQ below for more information. Enter emails for who can see this content in the Invite area. They will get an email with the link to the file. Select these people's access level: can they edit or just view?